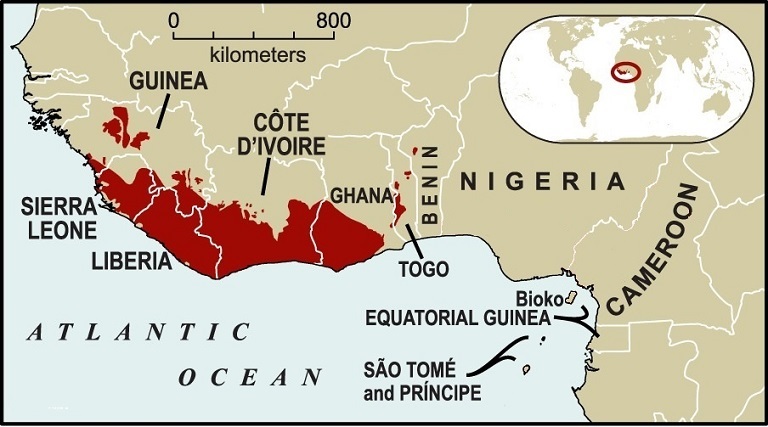 Palm oil companies signed a series of large contracts between 2008-2012 to develop plantations in Liberia. Disputes over land ownership by rural communities and the imposition of new environmental rules have forced investors to adjust their projections. The ‘High Carbon Stock’ approach, endorsed by environmental advocates, will restrict expansion in some cases. MONROVIA, Liberia – When Liberia signed a series of contracts with international palm oil producers in the years after its protracted civil war, the news was greeted by some as a welcome sign of national renewal. Despite criticism voiced by local and international advocacy groups that the massive deals amounted to “land grabs,” the prospect of tens of thousands of jobs, tax revenues for a cash-starved government, and repaired roads and ports was too much for Liberian officials to pass on. But with nearly a decade having passed since the first of those contracts was signed with the Malaysian conglomerate Sime Darby in 2009, the industry has struggled to find stable footing in the small country, which contains almost half of the intact Upper Guinea forest, one of the most biodiverse ecosystems in the world. Rather than the smooth, profitable green pastures that the industry hoped to find in Liberia, company representatives and environmental advocates say they’ve instead run into a buzzsaw of human rights and environmental campaigning, forcing adjustments to their business practices and expectations for the future. According to its concession agreement, Sime Darby initially set an ambitious goal for turning 75 percent of its “gross concession area” — 165,000 hectares, or nearly 650 square miles — into oil palm plantations within its first 15 years of operation in Liberia. After nearly eight years, the company has only managed to plant around 10,000 hectares, a tiny fraction of that figure, according to a recent study by Chain Reaction Research. Golden Veroleum, whose primary investor is the Indonesian multinational Golden-Agri Resources through its New York-based Verdant Fund LP, planned to have planted 30,000 hectares by now when it signed its contract in 2011, but according to company representatives only about half that amount has been planted so far. “I think it’s clear that the traditional concession model isn’t going to be nearly as effective in Liberia as it’s been elsewhere,” admits Andrew Kluth, a spokesperson for Golden Veroleum. At the heart of the palm oil industry’s woes in Liberia are clauses in their contracts in which the Liberian government promised the land they were being given was free from “encumbrances” — an industry term that meant they would not have to worry about land rights claims by locals. But producers quickly realized how disconnected those clauses were from the reality on the ground. Anger in rural communities over being left out of negotiations fed high-profile campaigns by Liberian activists and their allies in organizations like Friends of the Earth and Global Witness. Map of Guinean Moist Forests. Wikimedia Commons/Mario1952. In response to the stream of negative publicity and a series of complaints submitted by communities to the Roundtable on Sustainable Palm Oil, both Sime Darby and Golden Veroleum brought in The Tropical Forest Trust, an environmental consultancy firm, to review their operating procedures. Kluth admits that “mistakes” were made at first, but says that Golden Veroleum now respects community land ownership claims and engages in Free, Prior, and Informed Consent negotiations with local populations before developing any land. (Free, Prior, and Informed Consent – or FPIC – is the process by which investors and governments solicit consent for extractive projects from those who will be affected by it, and is a requisite for certification by the Roundtable on Sustainable Palm Oil). 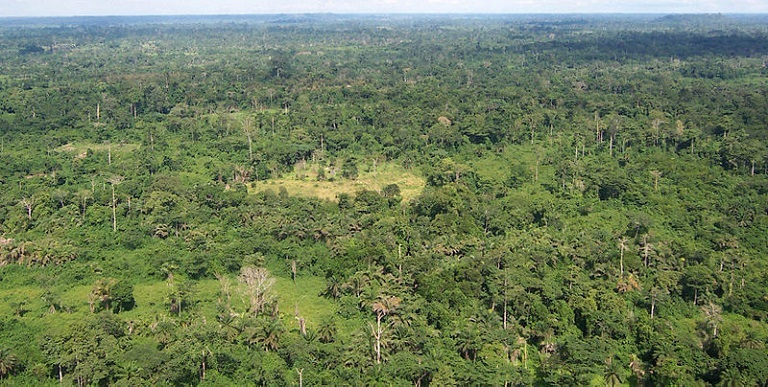 Increasingly, however, experts say that challenges in acquiring land from communities in Liberia are being compounded by new environmental standards that the palm oil industry has adopted. In response to pressure by environmental advocates that threatened to close off access to the European market, companies like Sime Darby and Golden Agri-Resources have publicly committed themselves to a “zero deforestation” approach. But the question remains: who gets to say when a forest is a forest? The most popular emerging tool to define what constitutes deforestation, designed collaboratively between organizations like Greenpeace and companies like Golden Agri-Resources, is called the “High Carbon Stock,” or “HCS” approach. Under the HCS approach, satellite data is used to determine the quantity of carbon in a patch of forest. If the carbon stock of that forest is larger than what would exist in a plantation full of palm trees and is over 100 hectares in size, it would be off-limits to oil palm producers. Liam Walsh, a representative from Conservation International, explains that the HCS approach emerged partially as a result of disputes in Liberia. While the HCS approach emphasizes carbon as the key unit of measurement in classifying a forest, producers say that they’ll still weigh factors like biodiversity when expanding into new areas, even when the carbon stock is below the HCS threshold. But the highly technical tools used to make those determinations can be bewildering, particularly to communities on the ground where older ways of defining a forest still apply. “If your idea of deforestation is cutting down trees, then you’re not going to be doing much of anything in Liberia because there are trees everywhere,” Walsh said, adding that some Liberian forests hold carbon stocks that are higher than the Amazon. Kluth claims that adopting the new rules didn’t significantly change Golden Veroleum’s expansion plans, noting that the company took care to select a concession area comprised mostly of degraded land anyway. But Sime Darby wasn’t as lucky. According to a study by international consultancy firm Chain Reaction Research, at least 45 percent of the company’s concession area in Liberia would be off limits under the HCS approach. The report recommends a series of options for Sime Darby to maintain the profitability of its Liberian operation. On the one hand, the report notes, the company could completely disregard its environmental and social obligations – a risky strategy that it is almost certain not to pursue. On the other hand, the report suggests Sime Darby could move toward contract farming, in which the company would act as a buyer for palm fruit farmed by communities on their own land. It warned that Sime Darby’s share price could decline once its investors realize how unlikely it is that the company will be able to clear and develop its entire concession area. For the moment, Sime Darby has implemented a global moratorium on new plantation expansions, including in Liberia, as it considers what the new environmental rules mean for its operations. Forest Peoples Programme lawyer Lomax says that the challenges faced by Sime Darby in Liberia killed enthusiasm in the company for operations in other African countries. Inside the Liberian government, there are rumblings in some corners about the glacial pace of development by foreign oil palm producers. The Liberian economy was hit hard during the 2014-2015 Ebola crisis, and a downturn in the global commodity market has damaged the value of crucial iron ore exports. Still, last November Liberia became a signatory to the COP22 Marrakesh Declaration on palm oil, committing the country in principle to adopting the HCS approach. Saah David, the REDD+ Project Coordinator for Liberia’s Forestry Development Authority (FDA), admits that there are sometimes “competing interests in government,” but says that there’s been progress towards getting everyone on the same page. According to David, the FDA supports the HCS approach. But he adds a caveat. “By virtue of the size of land and forests we have, concessions will be given in places where you have forests,” David said. Adoption of the HCS approach by the palm oil industry would be viewed by many environmental activists as a major victory, one accomplished by years of tenacious advocacy. But some community rights advocates are critical of the approach, saying that by excluding communities from its design it replicates mistakes that were made when the contracts were signed in the first place. Lomax, from the Forest Peoples Programme, says the HCS approach will marginalize their ability to make decisions about how nearby resources will be used. The approach was designed at the international level as a compromise between environmentalists and the palm oil industry, so it’s likely to cause frustration in communities that hope to rent land to companies but are prevented from doing so due to the new rules that will place some forests off-limits. Still, despite the obstacles they’ve encountered on both the social and environmental fronts in Liberia, palm oil producers say they’re in for the long haul. Plans are being drawn up by both Sime Darby and Golden Veroleum that would increase their focus on “outgrower” contract farming programs, placing more control and responsibility in community hands, and Kluth says Golden Veroleum still believes it can develop a “significant portion” of the 350,000 hectares it was granted in its contract. “I don’t think that what we’ve done and what we are doing has really been appreciated,” Kluth said. Lomax acknowledges that campaigning by advocacy groups has had an impact on the industry in Liberia, even if there are still problems and efforts by companies to bend their own rules. 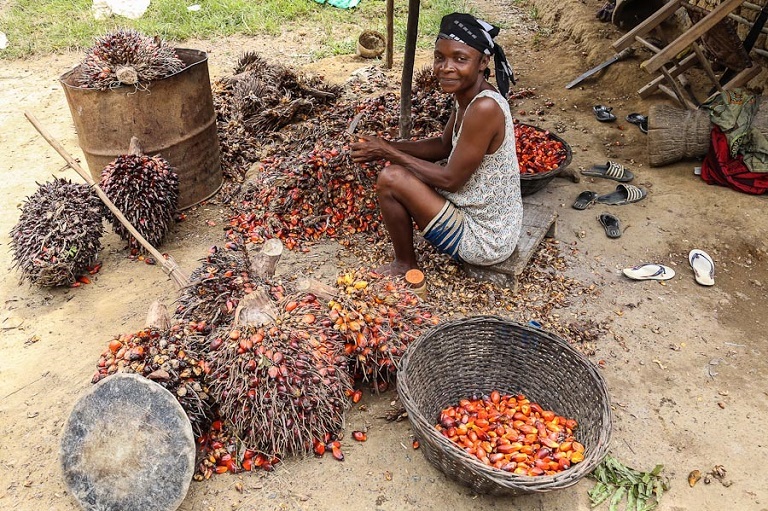 Banner image: Processed palm oil in Liberia. Photo by Antoshananarivo via Wikimedia Commons. 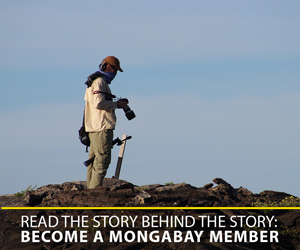 Ashoka Mukpo is a freelance journalist with extensive experience reporting in Liberia. You can find him on Twitter at @unkyoka.